Dolau Meurig01974 831332work Self-cateringDolau Meurig is a cosy single storey holiday cottage just 14 miles from Aberystwyth. It provides spectacular views over Cors Caron National Nature Reserve, the old Strata Florida Station and the Cambrian Mountains. On our doorstep is a cycle/walking track which follows an old railway line and offers easy access to a peaceful, scenic area for bird watching and leisurely walks. Just over half an hour's drive away is Cardigan Bay and its spectacular coastal path. Given our South-facing aspect, you’ll get any sun that’s going too. Across the sheep-fence, 20 yards from the cottage is our field where a small flock of ewes and lambs normally graze. The kitchen's stable-door leads to the back garden. There is a cosy living/dining area with a wood burning stove and large picture windows to enjoy the magnificent outlook. Separate small but well-equipped farmhouse style kitchen. Two south facing bedrooms, each with double bed and wardrobe. Further single bedroom with wardrobe. Bathroom with walk in shower, whb and toilet. Further side garden with shady apple trees, private patio area and BBQ. Front lawn with patio. 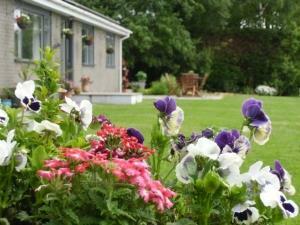 Dolau Meurig is a cosy single storey holiday cottage just 14 miles from Aberystwyth. There is the possibility of an extra, separate, double en-suite room in the adjoining house..